The Army National Guard is older than the United States of America. The first National Guard units were the colonial militias used to defend the original thirteen colonies. For most of US history militia units served as the largest part of the US Army in times of war. The states, rather than the federal government, trained and armed these militia units. This meant that many of the units had inferior weapons or lacked proper training. At the start of World War I, the US government created the National Guard from the state militias of the United States. Since then, the US Army has funded and trained the National Guard and used National Guard Units in times of war or emergency. The 45th Infantry Division was a National Guard Unit. Men from the state militias of Arizona, Colorado, New Mexico and Oklahoma made up the division. In September of 1940, the War Department called the 45th Infantry to federal service and began training for a possible war with Germany and Japan. During World War II, the 45th served in Italy, France, and Germany. 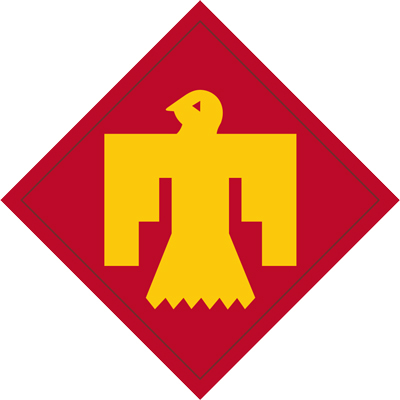 The symbol for the 45th Infantry is an American Indian "Thunderbird," so people call the 45th the Thunderbird Division as well. This icon was on the left arm shoulder patch of every soldier's uniform in the 45th Infantry Division. The image is a Thunderbird, an American Indian symbol common to the American Southwest, where all of the 45th Infantry Division's soldiers came from originally (image courtesy of Wikimedia Commons). 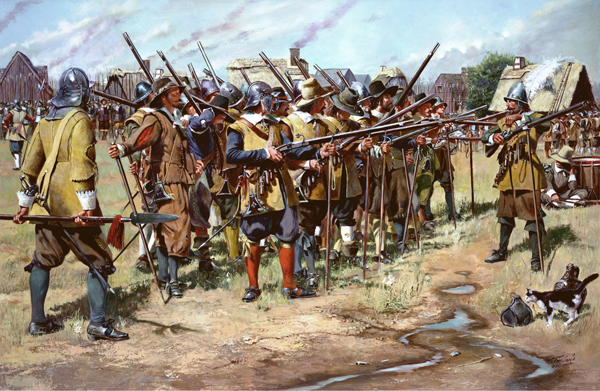 This is a painting of the Massachusetts Militia's first muster in 1636. A muster is when troops gather to train and prepare for combat. The 101st Engineer Battalion, 101st Field Artillery Regiment, and the 181st and 182nd Infantry Regiments are descendants of the militia units first mustered in 1636, making the National Guard over 375 years old (image courtesy of the National Guard).